Artists are self-organizing. This isn’t a new thing, but two recent instances of this type of effort have me cheering them on and wondering what drives artists to temporarily put aside their primary creating and do some meta-creating in Waterloo Region. The first event I heard of was the upcoming Waterloo Region Arts REBOOT, put together by Martin de Groot and Terre Chartrand. That’s happening this Saturday 9am-5pm at THEMUSEUM. I’m not able to attend, but I did pass on my concerns about the lack of affordable studio space anywhere near the spine of our region and the increasing challenge that the condofication of King Street poses for the arts. A lot of the older and larger buildings that would make awesome studio/gathering places are being transmogrified into pricey condos or refitted into top shelf tech digs. I’m still scratching my head over the City of Waterloo’s sale of the St. Louis school to a developer last year for less than $400K. That’s less than the price of a 3-bedroom house on the west side. And it’s right in the middle of our city on Allen Street with lots of parking and ready access to transit. What a missed opportunity for an artists’ den. I try to maintain a holistic view on the issue: people living and working in the core is great, but the consequent jacked rents squeeze artists to the city fringe or back to their basements and garages. The invisible hand of the free market is slanted to the more profitable return, so maybe we need to articulate a vision for a balanced arts/biz/residential mashup and agree on a way to make it happen. Terre told me last week that the intention from this and following sessions is create an ongoing record and extended discussion, so get out there and have your say. 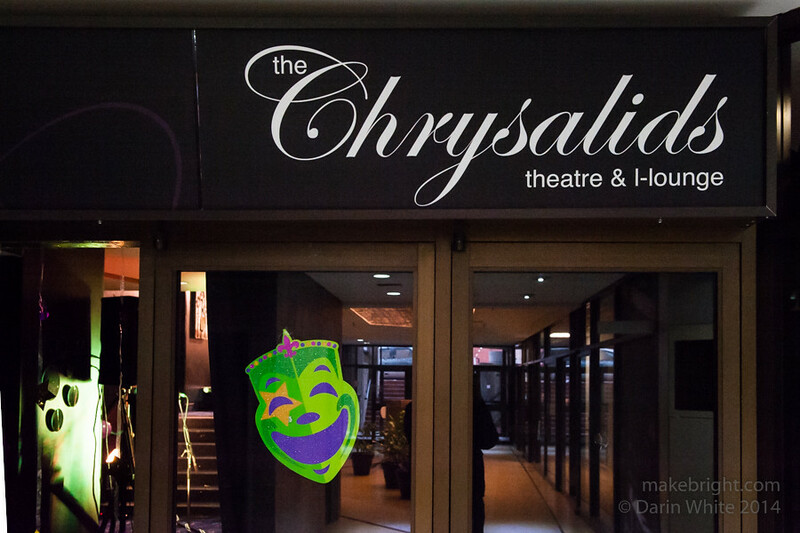 The other event I heard about later and attended first, was the inaugural Chrysalids Theatre Monthly Meet and Greet last Friday. This recurring meet, organized by Jospeh Chen and Gwyneth Mitchell, is intended to happen on the last Friday of the month. I got down to Ontario Street in the pouring rain and met with a great mix of musicians, animators, artists, and actors. There was talk of gaps in communication on sharing events, the availability of venues for music, and a lot of other themes that made me think way back to the Arts & Culture Rally I participated (and shot) a few years back. The discussion turned to the intent of the meetup: to simply network, or to work on projects, or to present work. That line of thinking takes me way back to the community establishment of kwartzlab. Get down there next month to participate. There’s beer and nice people; what more can you ask for? I have two observations about all of these efforts. 1. They do in fact make a positive difference, and sometimes not in the way expected or intended. 2. As UK Prime Minister Benjamin Disraeli is reported to have said: History is made by those who show up. So I keep showing up and contributing. This entry was posted in art and tagged organize, Waterloo Region. Bookmark the permalink.